Acura has needed to step up to the new age of luxury demands and has done that with the 2014 RLX and RLX Hybrid. Since my research of a personal car a few years ago had led me to purchase a 2005 Acura RL, I have wondered what was to come of the Acura brand in the coming years, mainly because the Japanese automaker has seemed to lost its mojo. I sat in a RLX recently and was very impressed. I loved the 2 "in-dash" screens, the top one being strictly for navigation, and the lower screen for audio/media. I really think that is a good move for this luxury car......it's too soon to copy Tesla's 17" touch screen. The driver seat was spacious, just like it should be, and the back seat was even bigger than I imagined. There were a few really nice RLX's at SEMA 2013, this Urban Luxury Sedan package was my favorite. The RL, even back in 2005, was my choice for luxury, performance, and the best value for my money. Needless to say.... it has everything! 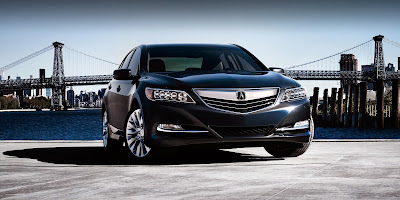 Now for 2014 Acura has established the most powerful "hybrid" powertrain from any other manufacture in its class. I could go on and on about this new car just from the general stand point; its 20 beams of bright headlights for instance, or its SH-AWD. For the hybrid its all about the 3 electric motors assisting the V6 with a combined 377hp, it gets an average of 30mpg, it has the new duel-clutch transmission, and new for 2014 is the rear wheels turn with the car along with the front wheels. They call it "Precision All Wheel Steer." I mean the rear wheels even "toe-in" to help slow the vehicle and to have more control when braking. Watch the video to understand completely what Precision All Wheel Steer is all about. I am now going to let AutoGuide take it from here in a first hand drive video below.